Beverage Wholesaler - January 14, 2019 To view this email as a web page, click here. Should alcohol distributors, retailers and producers worry about legal cannabis siphoning off sales? Not according to the Distilled Spirits Council. Sales of distilled spirits have not shown a negative impact in the first three states that legalized recreational cannabis, according to a new study by DISCUS. Nor have overall alcohol sales. Utilizing state-level alcohol tax receipts and alcohol shipment data, this study examined per capita alcohol sales in Colorado, Washington and Oregon for the two years prior to recreational cannabis legalization, and three-four years post-legalization (depending on the state). Southern Glazer’s Wine & Spirits today announced several changes in its East Region executive team, effective immediately. Walter Cowell, most recently the Vice President of Commercial Operations for Florida, has been promoted to Executive Vice President and General Manager of Mid-Atlantic, responsible for the Maryland, Washington DC, and Delaware markets. In this new role, Cowell will report to Gene Sullivan, President, East Region, and will relocate to the Washington DC area. Reporting to Cowell will be Jim Miller, General Manager of Delaware, and Andy Gergel, General Manager of Maryland and Washington DC. 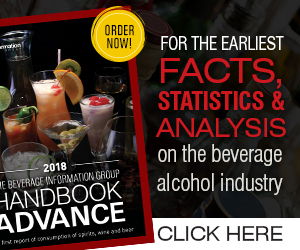 The Beverage Information Group is now collecting 2018 case sales data for spirits and wine brands for consideration in its annual Growth Brands Awards. For more information about the awards criteria and how to submit your brand’s data, please visit BeverageDynamics.com/GrowthBrands. Requirements: Provide analytical and systems support to the Finance team. Responsible for maintaining tools and reports to support financial planning and analysis for the commercial teams.